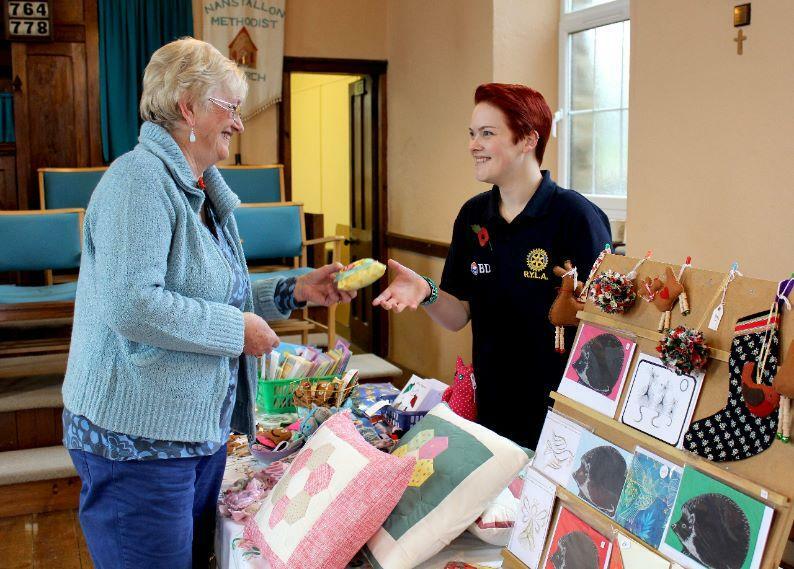 Jess Hill ex RYLA candidate in 2016 raised over Â£400 at her home village of Nanstallon by holding a coffee morning at the Chapel. Young People across the South West are raising money for the disater relief charity ShelterBox and this weekend they raised £407.90 by holding a coffee morning at Nanstallon Chapel near Bodmin. The sum was chosen because 5,563 is the distance in miles between ShelterBox's HQ,at the time , in Helston, to what was their most recent aid in Ecuador. Many people braved the Cornish drizzle on Saturday and enjoyed a variety of stalls from crafts to homemade cakes to bric-a-brac. The 'guess the amount of sweets in the jar' game went down a treat and so did the raffle, with prizes kindly donated from the Eden Project, the LOst Gardens of Heligan, Rodda's and Bodmin Nursery. Mike Pascoe, Treasurer of St Austell Rotary Club, said " it's fantastic to see a RYLA candidate doing something so positive within the community and raising money for a great cause. Its's been a wonderful morning and such a great event. Best of luck to all the RYLA 2016 participants in their future fundraising activities"
Jessica Hill, Event Organiser and RYLA participant, said "There was such an amazing turn out and I honestly can't believe how much was raised. It's been a great learning curve for me and I couldn't have done it without the support from friends,family and the local community. "Myself and the rest of the RYLA candidates still have a long way to go before we reach our target, but I'glad I've been able to contribute by putting on this event." There are 30 RYLA 2016 participants spread over the South West who want to give back to the community. They have been organising local events from cake sales to pub quize to raise the necessary funds and get the word out there. ShelterBox is an organisation, set up in Cornwall in 2000, that povides emergency relif to victims of disaster. In each box is a tent designed to withstand extreme weather conditions, water purification kit, blankets, tools,and other necessities to help a family survive after a disaster.